The nose is getting tighter. Michael Jackson's got much tighter over the years. That's what I get too. BUT... Mueller could benefit from information the southern district uncovers. I think of this as Anthony Weiners laptop. Why are you calling Mueller vile and corrupt? On what are you basing this assessment other than he's investigating trump and doing his job? Keep in mind this is not Muellers warrant. It's the FBI in the state of New York who are executing the search warrant based on a referral from Robert Mueller. The only time that a raid is really necessary is if they think that evidence could "go missing" unexpectedly, or if they suspect that evidence is in the process of disappearing. Perhaps that is what they thought or they could have also thought Cohen was being deceptive. We need to get more details. Then we get career losers like John S. McCain who does nothing but subsist on public money the majority of his adult life. An absolute waste of a human being. He should accept that he's unable to carry out his duty/job (by actually showing up for votes, and not making deluded public statements that showcases your dementia/stupidity). Instead, he continues to collect a paycheck and maintain his death grip on power at the expense of the tax payer. He'd rather collect his welfare (public money) and not do his job than give up power and let someone who will do the job step in. I may not agree on a lot of what Mcain says and does. But how dare you disrespect a war hero like that. I am truly disgusted by that remark. You should feel ashamed by what you just said. If it was a crime to pay someone to keep quiet about a consensual affair, I am pretty sure we would lose a huge chunk of Congress. This is an absolutely absurd reach. They raided his office his home and his current hotel room. Talk about Deep State corruption and shenanigans. 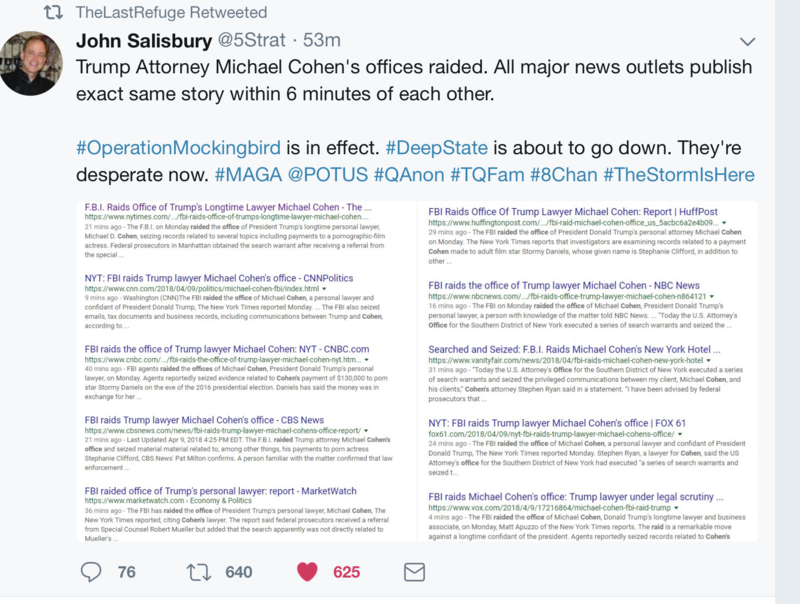 The Puppet Mockingbird MSM were primed and ready to go by their sold-out Handlers.